It'll be a dark and stormy night on the moon. Well, dark anyway, because tonight is the only total lunar eclipse of 2010. Visible to people in North America starting at about 9pm Pacific this evening, the Earth will pass between the sun and moon, blocking the sun's light from reaching the moon's surface. We’ve launched a live telescope feed in Google Sky, and we’ll be broadcasting the whole event so that you can keep tabs on the event regardless of the local weather conditions. To find the feed, which we created in partnership with slooh.com, fire up Google Earth and enter Sky Mode by clicking on the Planet Icon in the toolbar and selecting Sky. 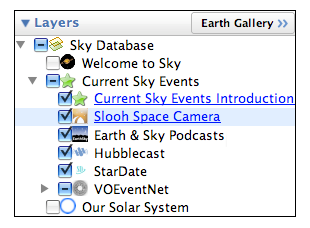 Then, open up the Current Sky Events folder and click on the blue Slooh Space Camera link to open the feed balloon. Be sure to check back after the eclipse too and follow along as we and Slooh broadcast more live images from their telescopes.